I love reusable bags. Whether it’s a trip to the grocery store or to the beach; they can be used for almost anything. However, I’m not a fan of your basic flimsy polyester logo bag that every store seems to carry now. 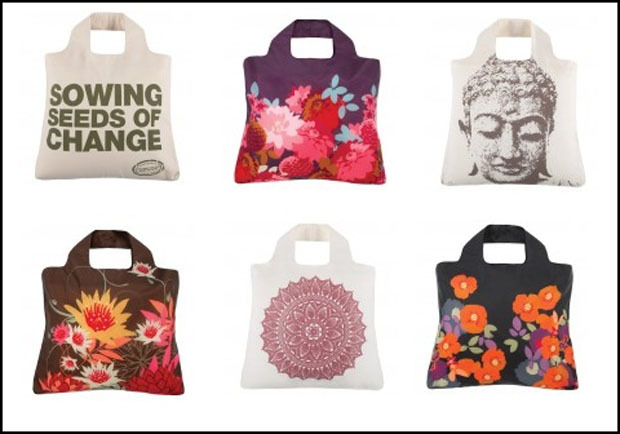 Thankfully there are many stylish and sturdy reusable bags to choose from. One such bag comes from Envirosax. Envirosax carries a range of bags from organic cotton, hemp and bamboo materials to linen and nylon. They have numerous solid colored bags for the Plain Jane’s of the world and great graphics for those of you who are more daring. I recently purchased the bloom series and brought them with me on a trip to the grocery store. My five bags packed neatly into the included pouch, which is small enough to fit in a handbag or car glove compartment. When opened, these bags are huge and can hold up to 44 pounds. On this particular trip I only needed 3. I love these bags because they are stylish enough to use everyday. You can bring them to the mall and grocery store on a picnic or to a playdate. More importantly; they are washable, waterproof, reusable and help to keep plastic bags out of our environment. They also make a great gift! You can learn more and purchase by clicking on Envirosax Bags or visit the Envirosax website.